The question of the "dramatic principle" in the Canterbury Tales, of whether and how the individual tales relate to the pilgrims who are supposed to tell them, has long been a central issue in the interpretation of Chaucer's work. Drawing on ideas from deconstruction, psychoanalysis, and social theory, Leicester proposes that Chaucer can lead us beyond the impasses of contemporary literary theory and suggests new approaches to questions of agency, representation, and the gendered imagination. Leicester reads the Canterbury Tales as radically voiced and redefines concepts like "self" and "character" in the light of current discussions of language and subjectivity. He argues for Chaucer's disenchanted practical understanding of the constructed character of the self, gender, and society, building his case through close readings of the Pardoner's, Wife of Bath's, and Knight's tales. His study is among the first major treatments of Chaucer's poetry utilizing the techniques of contemporary literary theory and provides new models for reading the poems while revising many older views of them and of Chaucer's relation to his age. 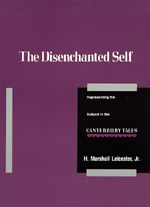 H. Marshall Leicester, Jr. is Professor of English Literature at the University of California, Santa Cruz. He is the author of several articles on Chaucer and medieval literature.